More than $100,000 was raised at the exclusive one-night-only reading of Terms of Endearment presented by Berlanti Productions and Jessica Queller at the Geffen Playhouse. The reading took place Monday, October 1, on the Geffen Playhouse main stage with an all-star cast that included Melissa Benoist (Supergirl, Glee), Kate Burton (Scandal), Calista Flockhart (Supergirl, Ally McBeal), Willie Garson (White Collar), Alfred Molina (The Front Runner, Spider-Man 2), Kumail Nanjiani (The Big Sick, Silicon Valley), Italia Ricci (Designated Survivor), Chris Wood (Supergirl, The Vampire Diaries) and Constance Wu (Crazy Rich Asians, Fresh Off the Boat). Notable attendees at the event include Harrison Ford, Rebel Wilson and Odette Annable. The original Terms of Endearment cast featured Shirley MacLaine, Debra Winger, Jack Nicholson, Danny DeVito and John Lithgow. Supporting artists is central to the Geffen Playhouse’s mission, and the New Play Development Program is a cornerstone of that support. As one branch of the Geffen’s many efforts to foster new work, The Writers’ Room playwrights group creates community between visionary Los Angeles artists, many of whom are emerging on the national theater scene. This monthly group provides the resources to help writers develop ambitious passion projects — plays and musicals that shed new light on the pressing issues of our city and our time. 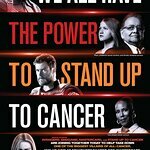 Stand Up To Cancer enables scientific breakthroughs by funding collaborative, multidisciplinary, multi-institutional scientific research teams and investigators. Thanks to the support of our dedicated partners and the entertainment community, SU2C is able to bring widespread attention to cancer research. 100% of donations received from the public support Stand Up To Cancer’s collaborative cancer research programs. In just 10 years, SU2C research has contributed to FDA approval of five new cancer therapies, including treatments for breast, ovarian, and pancreatic cancers and difficult-to-treat leukemias.